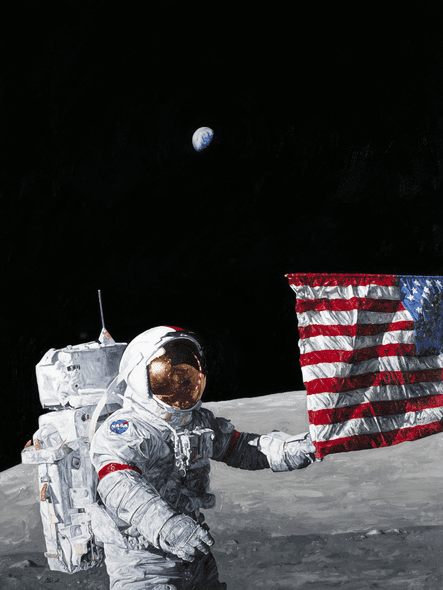 Chris Calle Hand Signed and Numbered Limited Edition Giclee on Canvas:"Last Man on the Moon"
Edition: Artist Hand Signed and Numbered Limited Edition to 250/100/25/17. About the Art: Through a strong sense of design, Chris Calle's original lithographs reflect his concern for the environment and vanishing wildlife. He began his career as an artist after graduating from the University of Michigan School of Fine Art in 1983. Since that time, Chris has completed assignments for such major clients as Reader's Digest, NASA, the National Wildlife Federation and the U.S. Postal Service. Chris has designed many U.S. postage stamps, including the Connecticut Statehood, Harry S. Truman, John J. Audubon and the 20th Anniversary of the First Man on the Moon commemorative stamp. Chris shares a special interest in stamp design with his father, Paul Calle, who designed the original stamp commemorating the landing of the First Man on the Moon in 1969. Although Chris has always been interested and intrigued by original lithography, it was the printmaking classes taken while in college that really allowed him to begin experimenting with the process. It was then that Chris began to realize the great potential for original lithography as a unique vehicle for his drawing. Chris has drawn since early childhood. He often observed and sketched nature with his father, who continues to be a constant source of knowledge and inspiration for him. His interest in wildlife began when he and his brother, Paul, became volunteers at a local nature center. Chris soon enrolled in the art classes offered at the center, painting and drawing the animals he observed. His brother chose to focus his time and attention on feeding and caring for the animals. Today, the brothers' continued interests in wildlife are reflected in their work, Chris through his artwork and Paul through his work as a zoo veterinarian. Their wildlife interests are once again combined as they collaborate on the written texts for Chris's original prints. Chris's decision to begin a series of original lithographs on endangered species was prompted by his concern for the environment and the unfortunate fate of all too many species. Through my artwork, I hope to bring about an increased awareness of the plight of the animals I portray," says Chris. "Perhaps, through education and conservation efforts, it won't be too late for many species. Unfortunately, it is a sad reality that many species of wildlife are being lost forever. My hope is to one day be forced to discontinue my endangered species series due to lack of subjects."